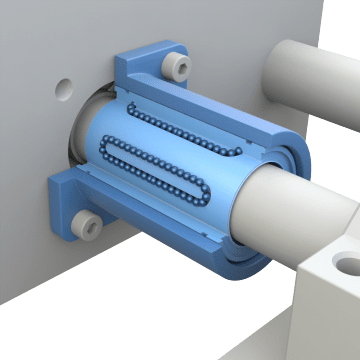 These flange-mount bearings contain linear ball bearings, which typically produce less friction and tolerate higher speeds than linear sleeve bearings. The bearing has a flange mounting plate that can be fastened to a surface to support the shaft as it moves under load. Since the bearing is not mounted in a housing, these flange-mount bearings have a lower profile than base-mount bearings. The shaft passes through the bearing at a right angle to the surface, making these bearings suitable for vertical setups. The square-shaped flange on these units has a mounting hole in each of the four corners to align with matching mounting holes on the equipment surface. The multiple connection points secure the unit and help to support the shaft. 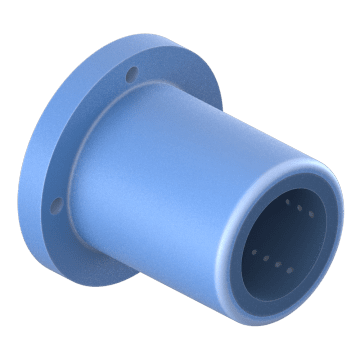 Align the mounting holes of these round-shaped flanges with matching mounting holes on your equipment's surface. 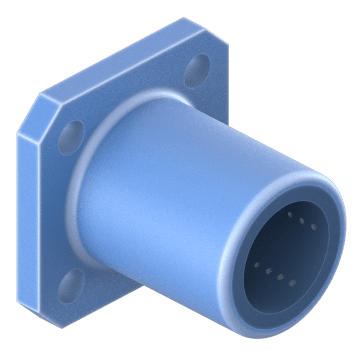 The multiple connection points around the circumference of the flange secure the unit and help support the shaft.